Last weekend I had the pleasure of attending the most fabulous wedding EVAR of my cousin down in Florence, Arizona. Fun Fun. Happy Happy. 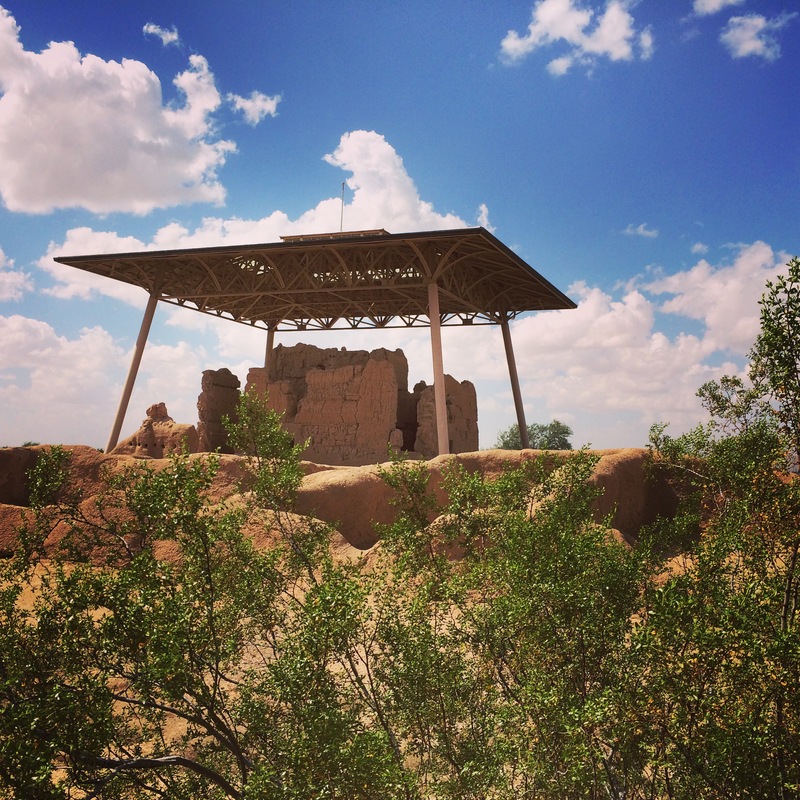 On the way back towards Phoenix we decided to check out Casa Grande Ruins National Monument. From a distance the great house made from a mix of sand, clay, and limestone can be seen. It makes quite the formidable site because a structure has been lovingly been created to save the house from further rain and sun decay. The structures were made by the Hohokum people settling near the Gila river around 1350. This and other houses were build around irrigation canals created for agricultural purposes and survival in the harsh desert. (It was harsh enough for me at only 95 degrees last weekend.) A short time later we are left with fragments of the buildings left in the Sonoran desert. Old graffiti can be seen inside from the 1850s when people would pass by. I love the desert. My skin and my lungs may not but I enjoy the beauty of the harsh environment with nearby Saguaro cactus dotting the landscape. Cactus, birds, snakes, and hills in the distance marking your progress. This was a nice little oasis on the drive from remote Florence back towards the civilization of Phoenix. I was horrified to see all the graffiti there! Then I realized that it was from the mid to late 1800’s and it made me question defacing a relic because now we have more historical information from a different period. Not that I came to a conclusion about whether it is right or wrong. Now blowing up or paving over history, there is no excuse. Its awful but interesting at the same time to see the old graffiti. I recall seeing some similar graffiti in Southern Utah from the 1800’s where people used guns to shoot their names up on ancient walls. Its awful but historical in its own right. I read a thought provoking book questioning preservation (What Time is this Place). He argued that not every old building is worth saving; some just need to be razed, some photographed and torn down, and others restored. I have always thought about his arguments. What we are seeing ruined around the world is irreplaceable knowledge and culture. It horrifies me every time I see it happen; there is no excuse other than ignorance. I didn’t know about the UNESCO list until a couple of years ago but always check it now before I travel. Those are the places that I seek out to visit. I am torn on the idea of “good” graffiti. On one hand, you are defacing another’s work. But when I think of New York in the 70’s, the graffiti is more iconic than the old subway cars. Maybe art will prevail over engineering? Thank you. That was taken just off the side of the road in a pretty little area with a lot of the saguaro cactus. I couldn’t help but stop. A nice B&W shot. 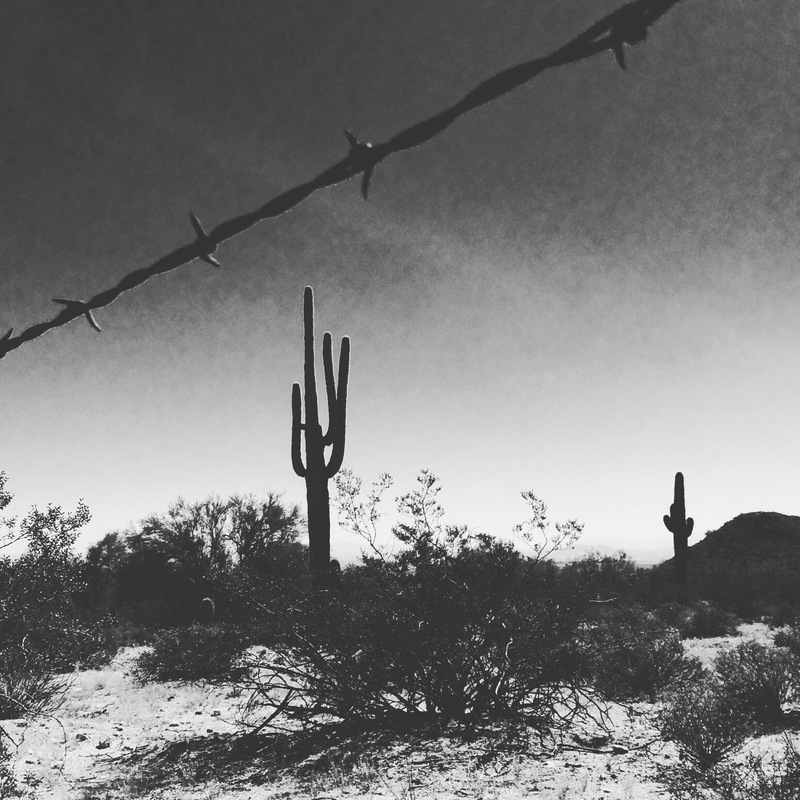 Like the cactus and the barbed wire. You say you love the desert. Interesting. I’ve been to many, many places but never to The Desert. A very old friend of mine was working in Algeria (peace corps sort of thing) and took a ten-day trip to the Sahara desert. He came back transformed. Weird. Maybe you should try it some day. I never liked it as a kid because it is so damn hot. But my cousin took me on some hikes through the desert showing me a lot of the details and life of the desert and I started enjoying it. I then spent a fair amount of time at Joshua tree National Park in Southern California and I fell in love. I don’t think I could live there because the heat is just too much but I do enjoying visiting whenever I get the chance. That might knock out a few barrel list items at once! From personal experience and from researching a historical novel, survival in the eastern hardwood forests was no simple matter. That the first peoples not only survived but seemed to improve their habitat in such a harsh and unforgiving place is truly amazing. No joke. I could barely take the heat hanging out for an hour or so. Rough life for sure. Thanks for the comment. I like the angles you chose to capture the scenery. There’s a lot of interesting history to explore around Arizona…. more than I ever imagined. Thank you. I try to make it interesting. One of my favorite archaeological sites! It was pretty cool for sure. Well , actually it was pretty HOT. It’s too bad a lot of the other structures are gone but I did seen several mounds on the horizon that were likely un-excavated buildings. It will be interesting to see what they find in the future there. They have a very nice exhibit there too I must say. It was a nice perfect short visit for sure.